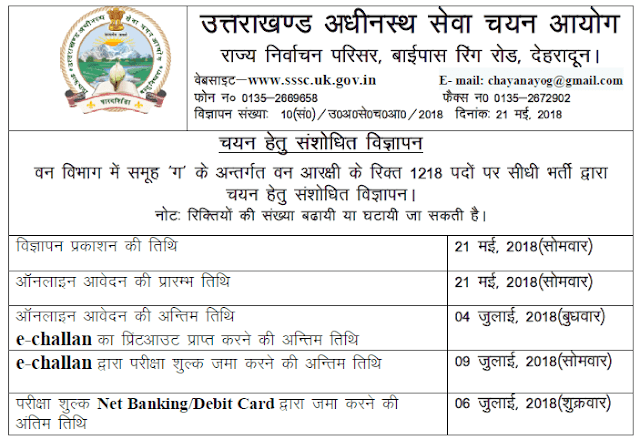 Uttarakhand Subordinate Service Selection Commission (UKSSSC) has advertised direct recruitment of 1218 Forest Guard posts. Uttarakhand Subordinate Service Selection Commission (UKSSSC) has advertised direct recruitment of 1218 Forest Guard posts. The online application process has begun for the recruitment. Candidates who have applied for this recruitment in the past do not need to apply again, but they will have to select the district for physical fitness test in their application form. Interested and Eligibile candidate can apply through official website of UKSSC or a direct link given in this article. The candidate must have qualified intermediate or any equivalent degree from a recognized board/institute in India. Preferential eligibility: Candidate should have served in the territorial army for at least two years. Or candidate should have a 'B' or 'C' certificate in National Cadet Corps.